The nuclear family was once as American as the nuclear bomb. 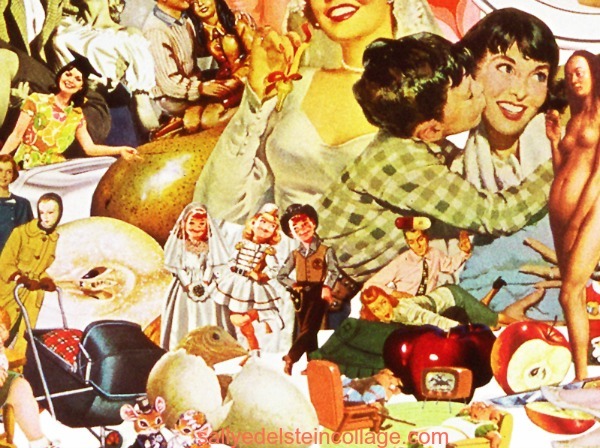 But by the end of the 1960’s the nuclear family detonated along with our notion of marriage and motherhood. Parenting and partnering were not a priority for the newly liberated lady…..just ask Mad Men’s Peggy Olson. As the decade drew to a close, the New Frontier years of Camelot came to a crashing halt and turned out to be just one more fairy tale. It wasn’t long before the spell was broken and we realized not everyone would live happily ever after like Cinderella. The only shining white knight coming to the housewives rescue would be the Ajax White Knight galloping into her suburban neighborhood destroying dirt in his path with his magic lance. Only 10 years earlier, the family’s outlook had never been brighter. McCall’s Magazine even created a term for this Togetherness. Along with the rest of the media, the real mad men of Madison Avenue painted the same glowing picture of the American family emphatic in their belief that the family was the center of your living and if it wasn’t you’ve gone astray… or you’re a communist! Some magazine articles even went so far as to imply that a woman’s failure to bear children was a quasi perversion and just plain unnatural. Nothing was more patriotic than having children and like the steel industry, mothering was running at close to 100% capacity. With their gleaming Ipana smiles, happy homemakers asked nothing more of others than to refrain from scuffing up the shine on her freshly Glo coated floor. In a world rampant with wars , rioting and male entitlement, these happy housewives may have been smiling but more than likely they were numb from Miltown or Valium. Like underground nuclear testing anger was to be buried beneath the surface, but the fall out would soon appear. Before the decade was out women would become as agitated as their miracle 2 agitator washers. But by the late 1960’s happy housewives with their smiling faces dressed in harmonized shades to match their carefree kitchen appliances, were, like those same retro appliances replaced for a newer model. Detail of collage by Sally Edelstein “Always Ask a Man” An amalgam of mass media stereotypes of women from the 1950’s and 60’s . A reshuffling of clichés about popular cultures representation of female choices. With the bewitching speed and ease of Samantha Stevens twitching her nose the job a generation of women had trained for was suddenly obsolete by 1970. Along with their bras, women libbers threw out the American housewife and June Cleaver got kicked to the curb. As if hit by a strong dose of radiation, the familiar 1950’s nuclear family in the media had mutated into monstrous families as June and Ward Cleaver were replaced by Lilli and Herman Munster. 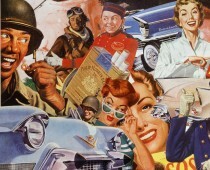 I followed your link on the NYTs ‘Mad Men’ blog, great work!